Everyone loves a candle, they cast a lovely warm flickery light, and, chosen carefully, can fill a room with beautiful scent (sure, sometimes they can fill a room with the scent of cheap pot-pourri, but this is a matter of taste!). 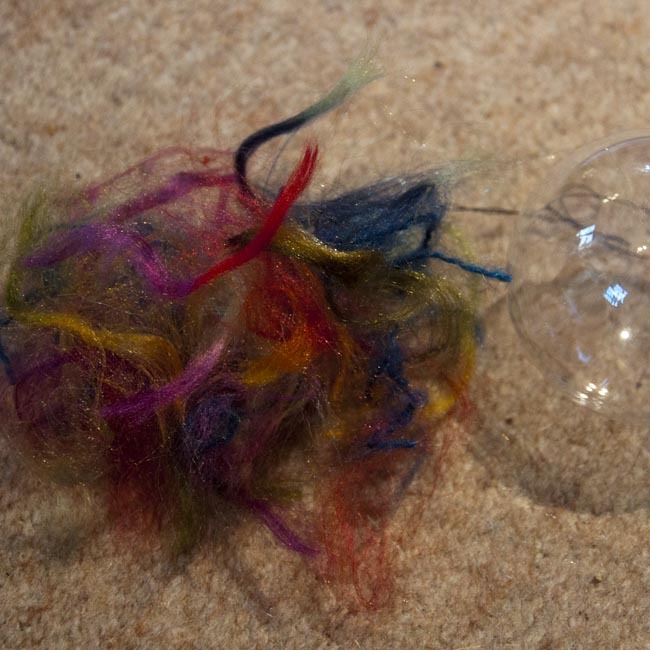 After Christmas, we had several left over candle ends around the house, and rather than throw them out, I wanted to do something creative and recycle them. But while there are lots of great candle-making kits out there, I didn’t really want to spend any money on the process. 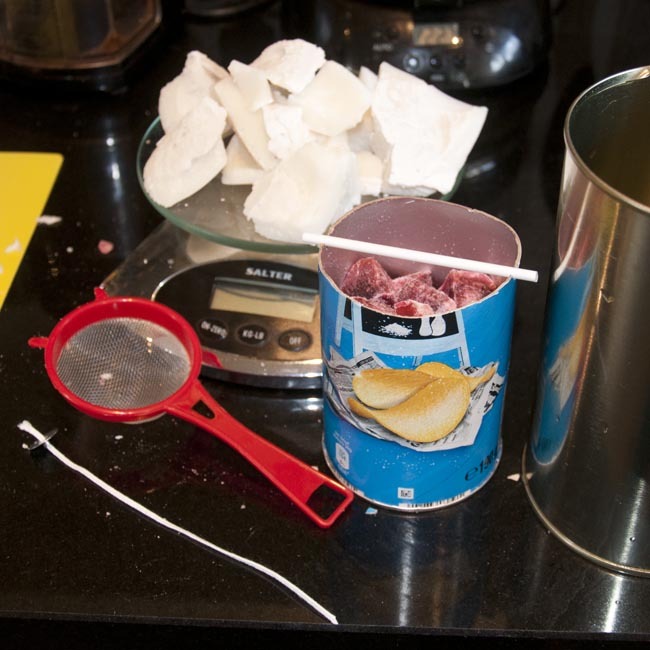 So this is a candle-making project that, with the exception of some wick and a wick sustainer, you can do entirely with things that you already have around your home and kitchen. Gather up your equipment, starting with the knife and the pringles tin. Cut the Pringles tin down to about 4″ high using your knife, and make a couple of ‘notches’ in the top on opposite sides of the top. 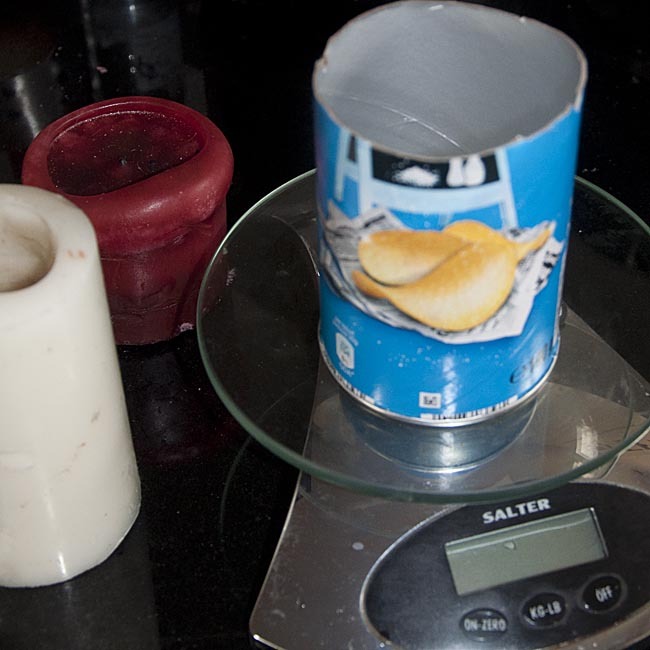 You’ll need to get an estimate of the capacity of your candle mould, so put a sandwich bag inside the Pringles tin, put it on the scales to zero, and then fill the bag with water to about a 1/2″ below the top. The weight in grams of water is a good estimate of the volume in mls, as wax is slightly less dense than water (it floats on water, after all), you can reduce this estimate by about 10% to get the weight in wax required to fill the mould to this level. I came up with 300g and used around 270g as a target weight of wax. Now, cut up your coloured candle. Try to cut it into even cubes a bit bigger than half an inch cubed, but it’s likely you’ll struggle, and if the pieces are a bit rough, don’t worry. From what you’ve chopped up, sort to one side and weigh all the sensible chunks, leaving the dust and small fragments aside (wrap these up for another project). Weigh your coloured chunks (mine weighed about 140g) and put them in the mould to check how high up they come. Ideally this will be about the target ‘fill’ level. Now roughly chunk up your white wax candle. It doesn’t matter what size and shape these pieces end up, but the smaller they are the faster they’ll melt. 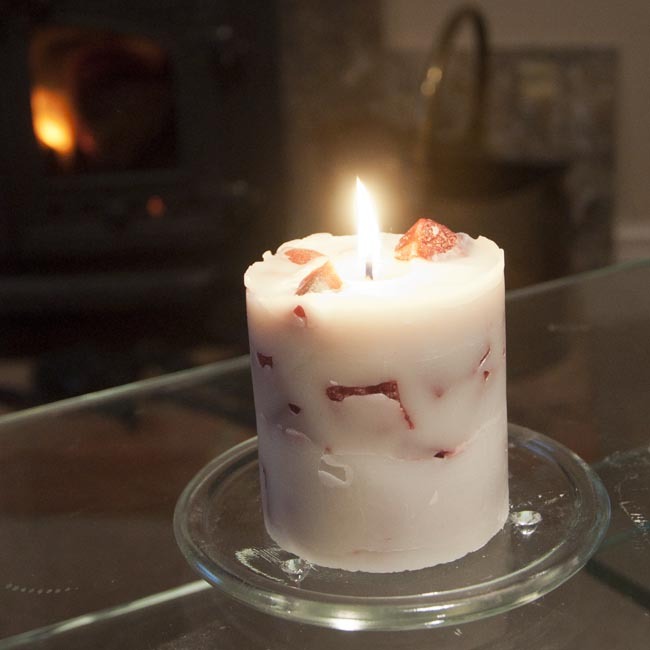 When working with old candles, try to avoid including the ‘melt pool’ from the candle as this will be dirty wax and may well include bits of old burnt wick and suchlike, which you don’t want in your shiny new candle. 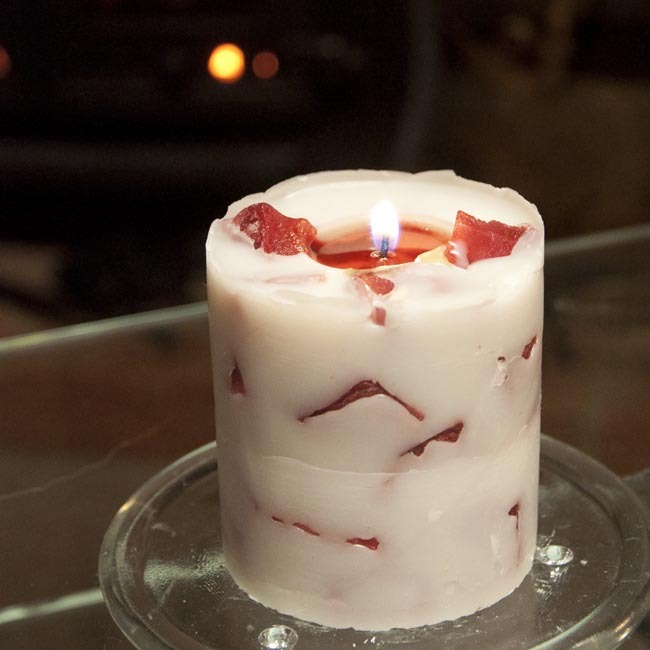 A word about wicks, before we go on – the size and construction of wick you need depends on the chemistry of the candle-wax and the width of the melt pool you want in your candle (which is closely related to the diameter of your candle, usually). When working with recycled waxes, the chemistry involves a fair bit of guesswork. I assumed the waxes were a basic paraffin pillar blend, since this is the most usual situation for commercial candles manufactured to a price point. There’s a useful wick size guide here. (See my suppliers list and library for more reading.) I used an LX16 wick which should have been a good match for the ~70mm diameter Pringles mould. Secure the end of the wick into the wick sustainer using pliers. Now, start melting your wax. Put the white wax into the large tin, and put the tin inside your saucepan on the trivet. Fill the saucepan with water so that it comes up the side of the tin about an inch and a half. Use the thermometer, if you have one, in the water. You don’t want this to boil, but ideally it should stay around 75 degrees centigrade, which should be enough to melt the wax without risk of overheating. 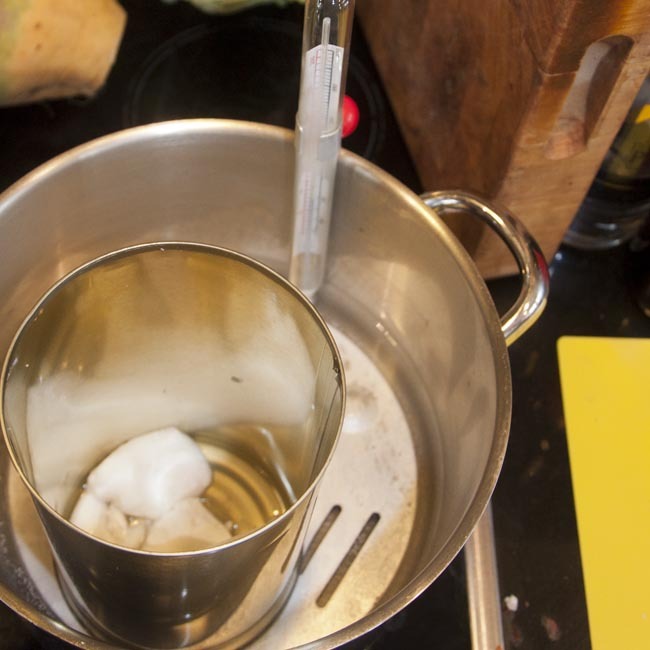 The flash-point of wax is quite close to the melting point, and at the flash point the wax is at risk of catching fire, particularly if you have a naked flame in the vicinity (for instance, if you’re using a gas hob), so be careful and heat the wax very gently. Once the wax is melted, you need to prime the wick, which just means dipping the wick into the wax so that it can be absorbed onto the surface of the cotton. 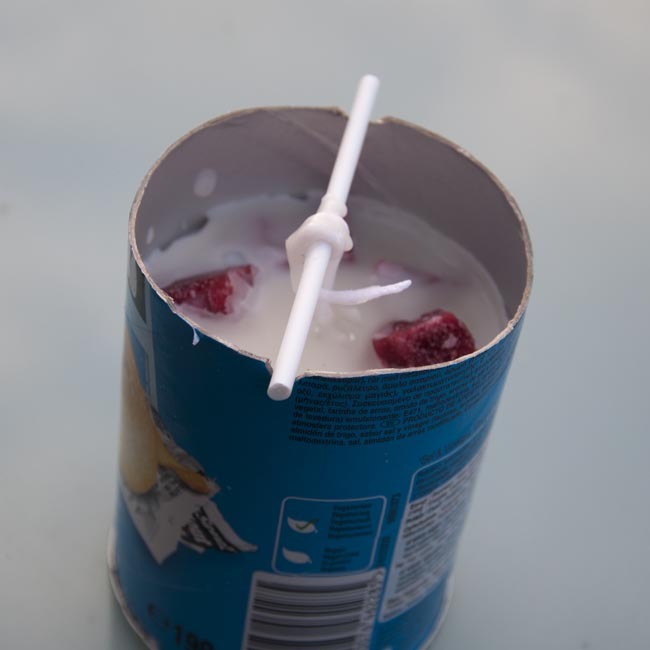 Also dip the sustainer in the wax, and use this to secure the sustainer to the centre of the bottom of the Pringles tin. 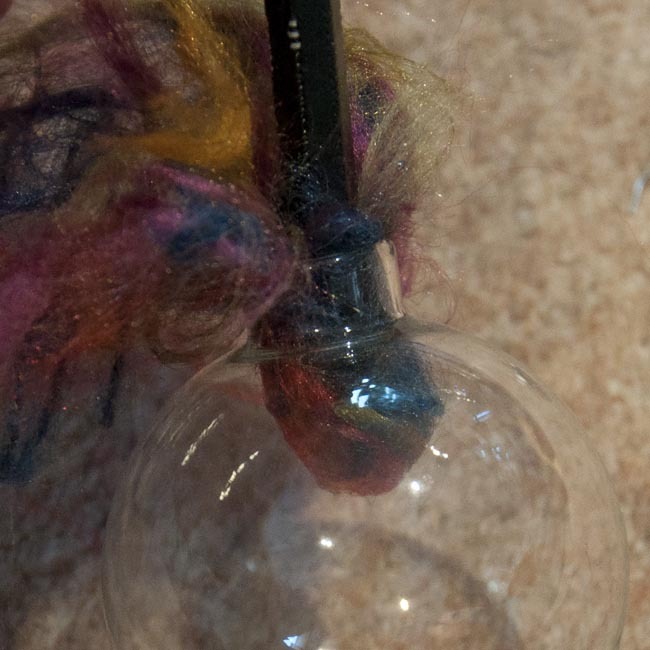 Stretch the wick up vertically and wrap it around the wick pin to keep it centred in the mould. 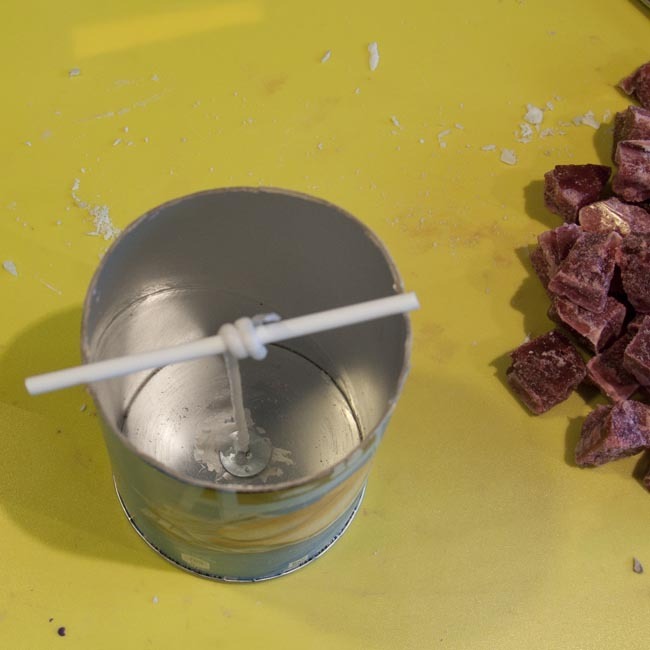 Now, arrange the chunks of coloured wax in the mould around the wick, trying to make sure you don’t close off any pockets which would prevent the melted wax filling all the gaps. When you’re happy, pour about 90% of the melted wax into the mould, pouring through the tea strainer if you see any ‘bits’ in it. Keep the remaining 10% over a low heat to keep it liquid, and continue to keep a close eye on it. The wax will shrink as it cools and this will form a dip or a ‘well’ near the wick, which will affect the candle as it burns. 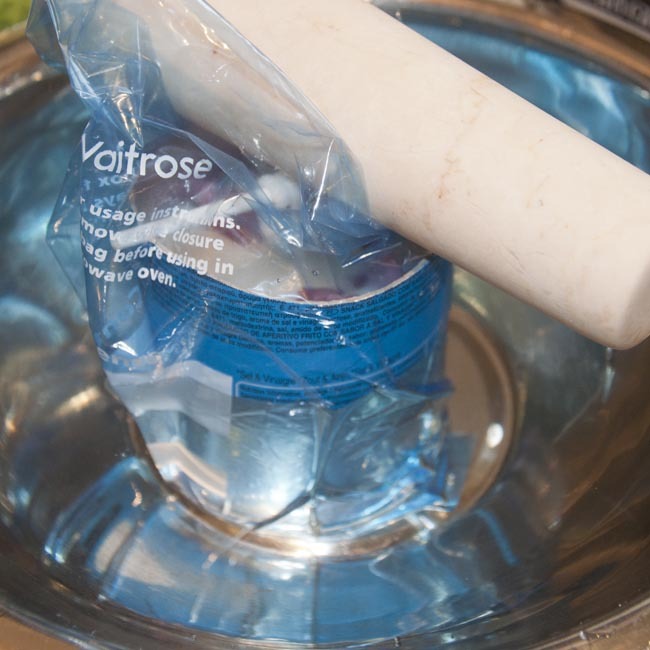 Encourage the candle to cool by putting the mould inside a plastic bag and immersing it into a bowl of water. 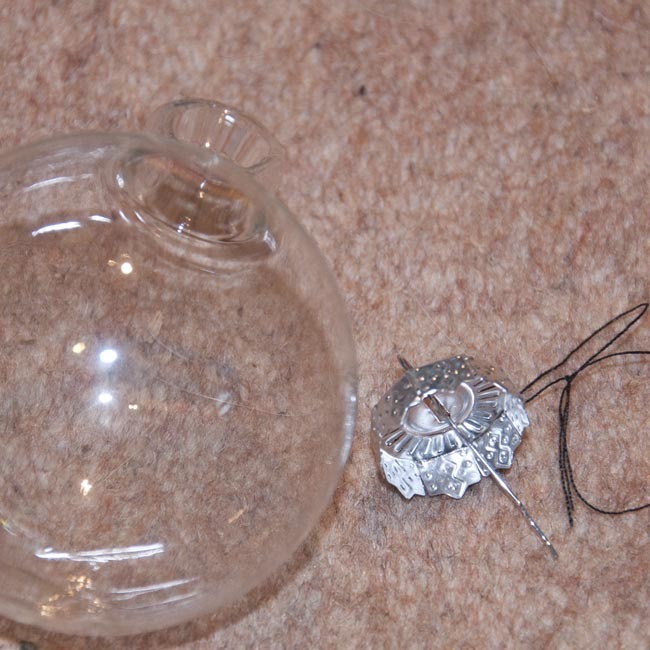 You will need to weigh it down to keep it immersed, I used a marble pestle, but anything heavy will do. This is of course quite faffy, and if it’s a nice cold day, you’d probably do as well to put the mould outside for half an hour or so. As the wax sets and you start to see a well forming near the wick, make a couple of holes in this area with a skewer. 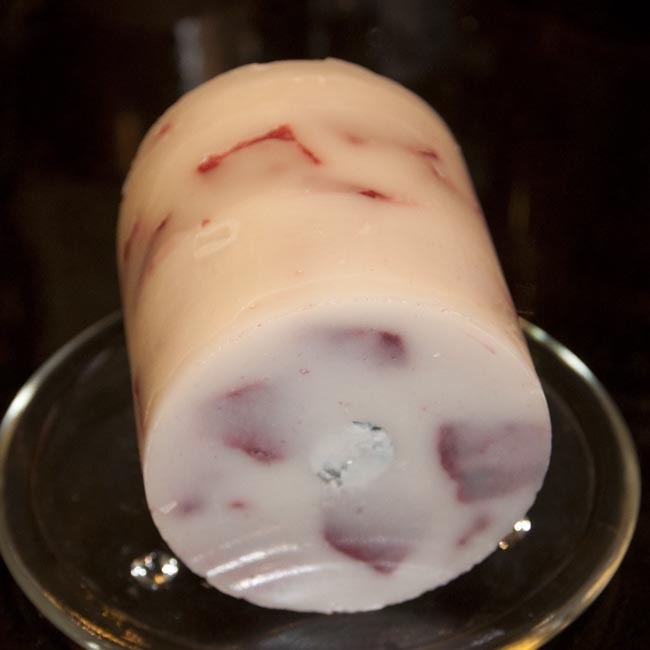 Once the surface of the wax is springy but not hard to the touch, pour over the rest of the wax tapping the mould to make sure it goes into the holes you’ve made near the wick. Now set the mould somewhere nice and cold to set – in the fridge if it’s a warm day, or outside if it’s January in the UK. After a couple of hours the wax will have set hard. I was expecting to have to sacrifice the Pringles can at the end of the moulding, but the wax had shrunk back nicely from the sides, and I was able to ease the candle out without having to destroy the mould – however your results may vary and I wouldn’t lose to much sleep about it if you have to break the mould away from the candle. Trim the wick so that about 1cm is proud from the surface of the wax. I’m thrilled with the results, which I think are very pretty for a first effort. The white wax is a little bit ‘dirty’ which I probably could have concealed by using a little bit of ivory or honey-coloured candle dye. I poured the bulk of the white wax in two ‘goes’ and you can see the line between them, which is something I’d avoid in future. 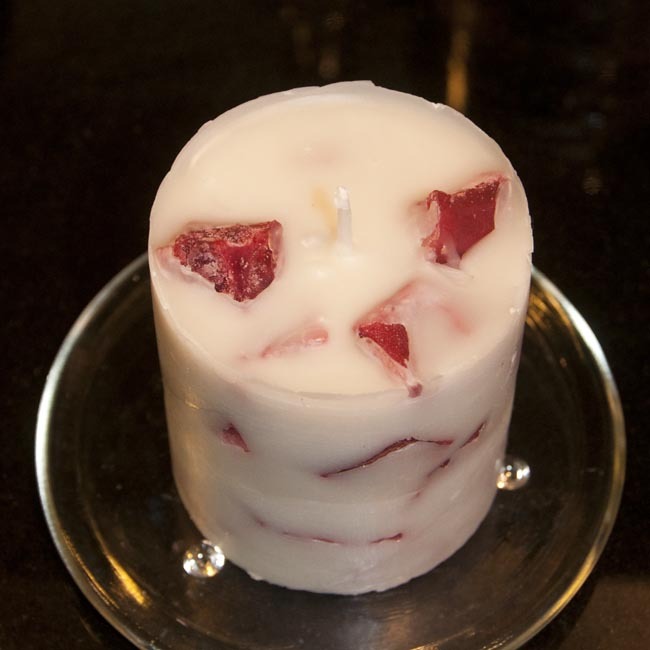 My only real criticism of the finished candle would be that I chose too small a wick – the melt pool the candle produces is quite a bit narrower than the body of the candle, and stops short of the sides by about half an inch all the way around. I suspect this is to do with the chemistry of the original white candle, which we stopped burning for a very similar reason – lesson learned! If I re-make this candle with the remains of the white wax from this batch I’ll use an LX20 wick which may give a better result. The melt pool is very pretty though, a lovely dark pink colour from the mixed waxes and gives a gentle berry aroma. For the cost of a new piece of wick, and a little bit of kitchen chemistry, it’s a beautiful, and extremely thrifty, scented candle. I saw Heston Blumenthal the other night on TV with his roast chicken recipe, and I wish I hadn’t. His suggestions really worry me. Leaving aside his recommendation to brine the bird before roasting (because what we all need in our western diets, ladies and gentlemen, is more salt! ), he advocates roasting the bird at 90 degrees centigrade (70, even, in a fan oven!) for several hours to a target internal temperature of 60C in the thickest part of the breast. While I have no doubt that this treatment results in a marvellously moist tender bird (it’s barely cooked after all!) the food safety implications of the process are pretty horrifying. All raw meat is contaminated with bacteria. This is just a fact of life – after all, meat is dead animal, and animals have bacteria in and on them in life which are impossible to remove in the course of processing. Poultry meat in particular is high risk. A UK study published in 2000 identified Campylobacter jejuni in 83.3% of supermarket chicken that they sampled. I would go as far as to say, I almost guarantee that any raw chicken you purchase will be contaminated with Campylobacter, Salmonella or E. coli, and the risks are probably higher with free range birds which aren’t raised in a sealed environment. The reason we don’t all have food poisoning all the time is that cooking – the application of heat – is extremely effective in killing these pathogens. Here’s the problem – Salmonella requires a temperature of 60C for 10 minutes to be effectively killed. Campylobacter also needs to get to 60C, though it’s a bit more fragile so a minute or two should do trick. E. coli is more robust – but less common in poultry meat – and needs to be heated to 72C. The universal advice for safe cooking of poultry meat takes all of this into account and advises the thickest (and hence least heated) part of the meat should reach a minimum temperature of 75C for at least 10 minutes. On these numbers you can see how Heston’s recipe might *just about* not be gastrointestinal suicide, but you would want to be very confident of your temperatures. The trouble is, any error in measurement – if your probe isn’t really in the absolutely coldest part of the bird – is going to read higher than the true lowest temperature, making it very easy to overestimate the minimum temperature and have parts of your bird below 60C. To be quite honest, I don’t care how tender and succulent this roast bird might end up – it amounts to food hygiene russian roulette! I’ll be staying away from the Fat Duck, I think. Please, if you want a wonderful succulent roast chicken, buy a good free-range bird with some good fat under the skin, add some lovely flavours in the cavity (I like a quartered lemon with some whole cloves of garlic and a handful of thyme), a little bit of salt and pepper on the skin with a couple of rashers of bacon if you fancy it, and then roast at about 180C to a safe internal temperature. Rest for 20 – 30 minutes before carving, and enjoy a tasty, succulent, and above all safe roast dinner! A whole roast chicken is a wonderful treat – more on that later – but it’s not the sort of meal most people want to wait for on a week night after work. We eat a huge amount of chicken in the UK, and a lot of that is bought pre-portionned and packed from the supermarket, it’s certainly convenient and the portion sizes are more practical. We’re in love with breast meat in this country, to the extent that the UK is a net importer of white chicken meat – mostly from Thailand and other East-Asian countries – and an exporter of leg meat. When you think about it, that’s pretty bizzare, not great for the environment (think of the fuel involved in sending the ‘wrong’ chicken backwards and forwards half way around the world! ), and leaves us eating lower health and welfare-standard poultry meat than would have been produced in the UK. It’s really easy to portion up a whole chicken, and learning this basic butchery skill will save you money. Even if you just buy a ‘bog-standard’ roasting bird from the supermarket, you get more for your money buying a whole bird and cutting it up yourself, and the savings are even better if you’re buying free range or organic chicken. And with a bit of kitchen creativity, one whole chicken can provide three or four meals for two people, as well as a lovely batch of chicken stock – bargain! 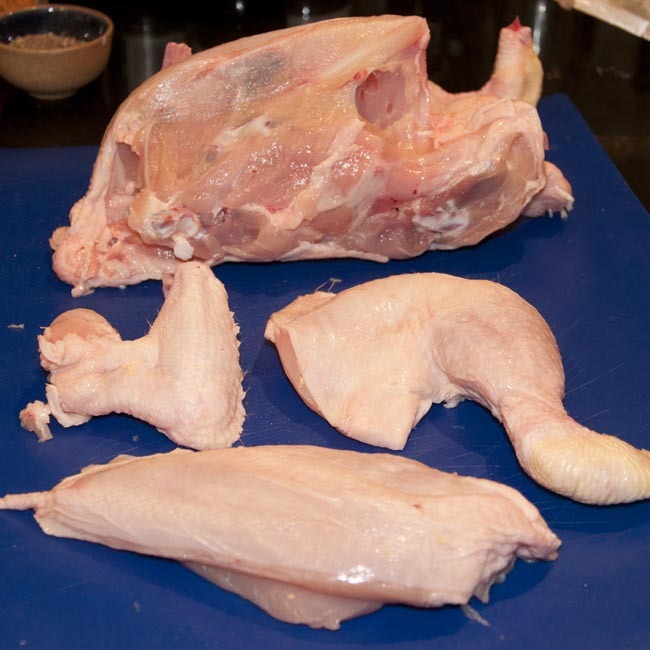 First, un-wrap your whole chicken and remove any trussing string / elastic holding the legs together. Pat it dry with kitchen towel as this will help with handling it while you’re cutting it up. You will need a very sharp knife with a long but reasonably slender blade. Feel down the centre of the bird, and you should feel a bone running the full length – this is the ‘keel bone’. Starting on this line, cut downwards parallel to the bone along the full length until your knife stops. You can now pull the top of the breast away from the keel bone to get a better look at what’s going on. The bone beneath the knife is the ribcage, so continue carefully cutting the breast meat away from this. If you work carefully you’ll leave surprisingly little meat behind on the carcass. After you’ve done this a few times, you’ll get a lot quicker, but speed is not of the essence the first few times. 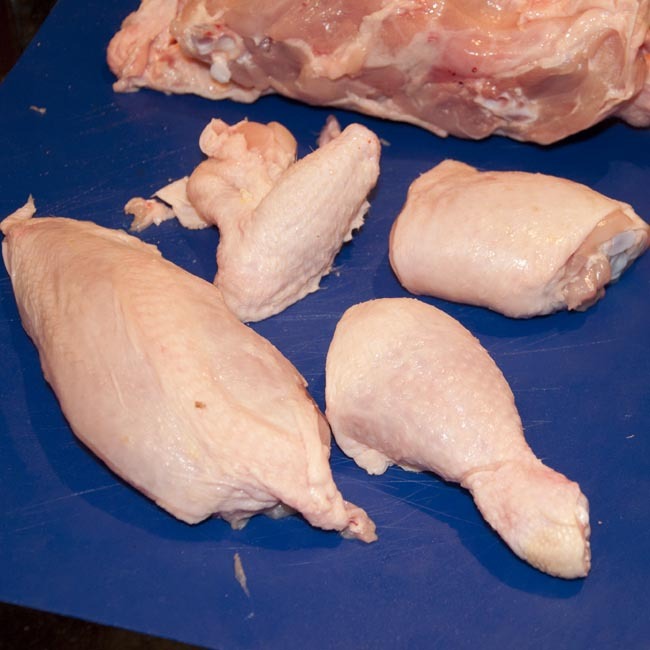 Once the breast meat is mostly free from the bone, cut the skin between the breast and the thigh and finish removing the breast from the bird. Now we need to detach the legs. Grasp the thigh and extend the leg away from the body. You should be able to feel the hip joint (indicated with the knife point in this photo). Insert the knife firmly into the joint to separate the leg from the body, then cut the leg meat away from the torso leaving as little as possible behind. 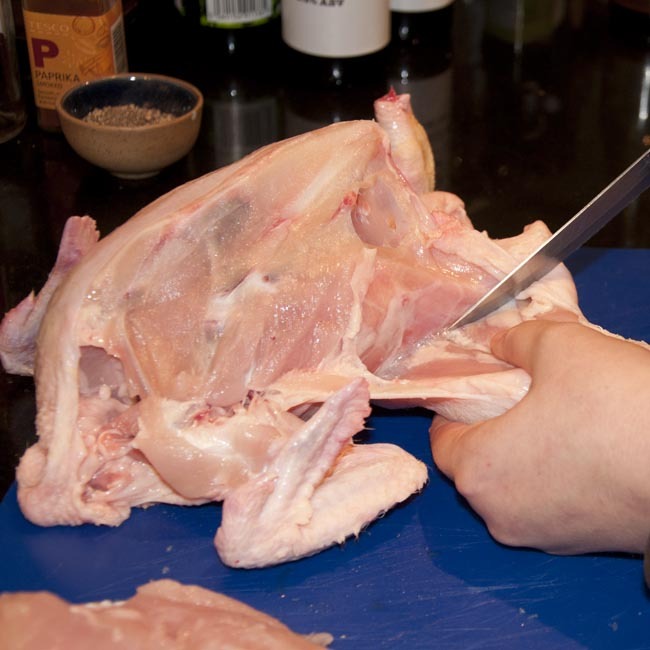 Grasping the wing in the same way, identify the joint and push the knife firmly through it, separating the wing from the body of the bird. Congratulations, you’re half way there! Repeat the process on the other side of the bird. Grasp the leg, and feel where the joint moves between the thigh and the drumstick. Simply cut down firmly along this line. If you’re accurate your knife will pass through the joint space, but the bone here is actually quite soft so if you’re not quite on target, you should be able to cut through anyway, it will just take a little bit more force. Cut off the ‘knuckle’ part at the bottom of the drumstick in the same way, and discard these (the only bit of waste in the process, as it happens!). You’re there – one whole chicken transformed into two breast portions, two thighs, two drumsticks and two wings, to do with as you please. With practice it’s less than a five minute job. Better still, think of the costings. With standard supermarket chicken (I costed this in my local co-op the other day), starting with a £4 bird, and bearing in mind two breast fillets retail for £3 (smaller fillets than you’ll get from a roasting bird, with the skin off and frequently robbed of their ‘mini fillets’, too! ), you’ve just got two thighs, two drumsticks, two wings, and a pint of excellent fresh chicken stock for £1. Use what you want today, and bag and freeze the rest. How’s that for thrifty! I said I’d come back to roasting chicken. That’s for the next post! Breast of lamb is a rather unfashionable cut these days. In my household it’s usually known as ‘lamb belly’ by analogy with the matching cut of pork. It’s made up of the abdominal body wall, starting with some ribs just in front of the diaphragm and extending backwards. Folded in three and wrapped in cling-film, it’s a rather uninspiring looking cut. You won’t get it at the supermarket, and it won’t be on display at the butchers, but if you ask it’s likely you’ll get a whole one for not much more than £1. 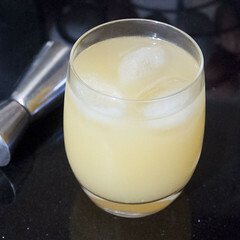 With a very little bit of effort, you have one of the most cost effective (and tasty!) roast dinners you can buy. 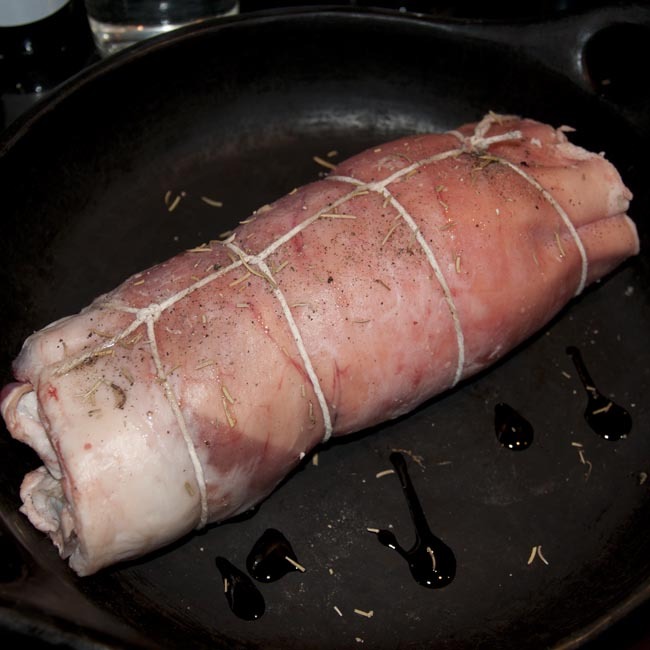 We first discovered breast of lamb when we started buying half-lambs from local smallholders. 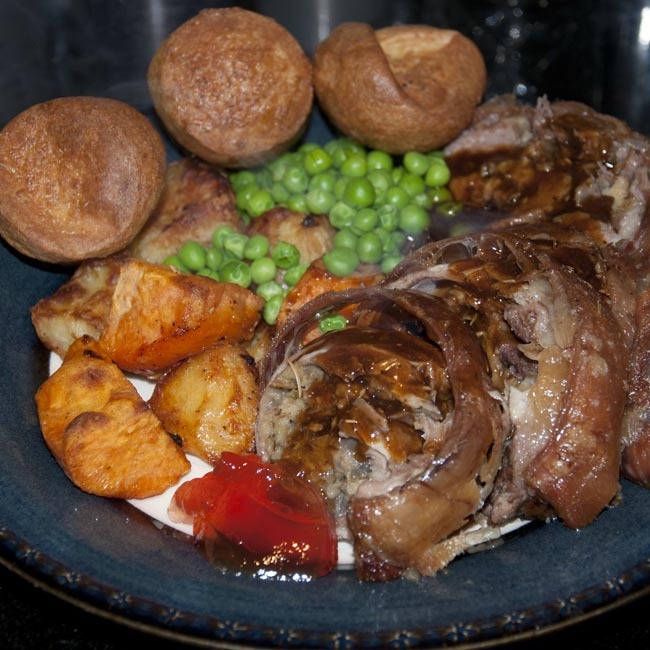 I wish I’d discovered it when I was a student, I could have had some fantastic roast Sunday dinners on a budget! First of all you have a little bit of butchery to do. 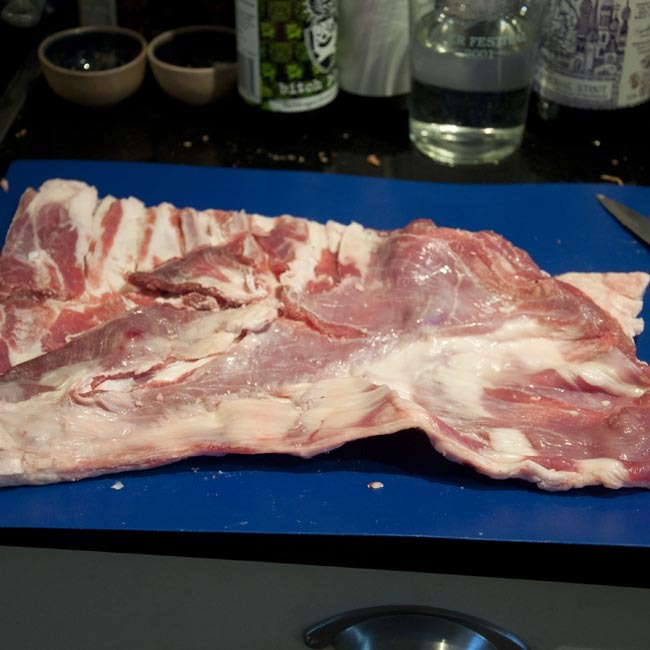 It’s unlikely the ribs will have been trimmed out, so you’ll have to do this yourself. Be careful, and patiently cut around and along each rib with a paring knife and lift it out from the ‘inside’ of the breast. With practice this is no more than a five minute job, though it might take a bit longer to start with. It’s likely your breast has been in the fridge, so the meat will be cold. Stop if you notice your fingertips getting numb, and rinse them under warm water to warm them up again – you’ll have less sensory feedback from cold fingertips and you’re much more likely to make a mistake and cut yourself – which is not the aim of the exercise! 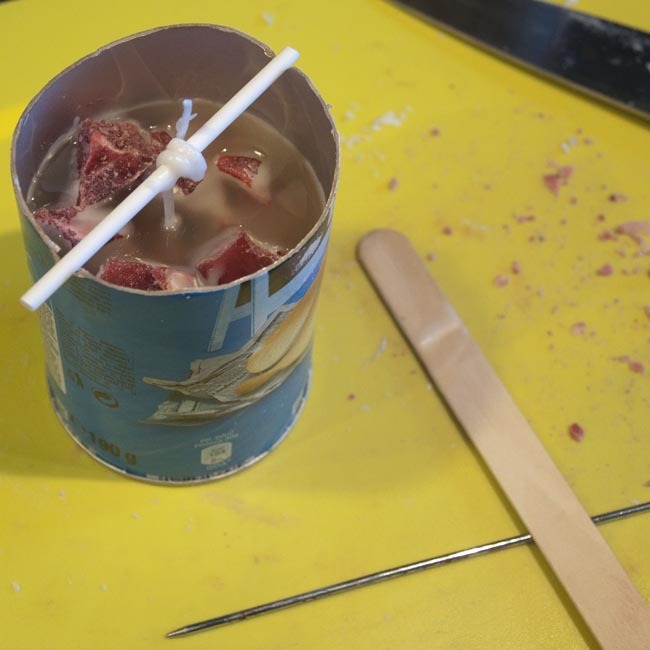 Try to preserve as much meat as you can attached to the breast – but if you accidentally cut a piece off (and there are some annoying bits of diaphragm which are quite tricky to keep attached) just put it back as you’ll be rolling and tying the ‘joint’ later. Now make the stuffing. Mix the finely chopped onion, crushed / minced garlic, breadcrumbs, herbs and egg together. Season with a bit of salt and pepper. Then spread this across the inside of the breast and roll it up, starting at the narrow end (where the ribs weren’t). Tie the rolled joint up with string using a butchers knot. This involves making a series of linked loops and tying off at both ends, and is a useful knack to learn. It’s also not dissimilar to the knotting technique used for casting a cow! 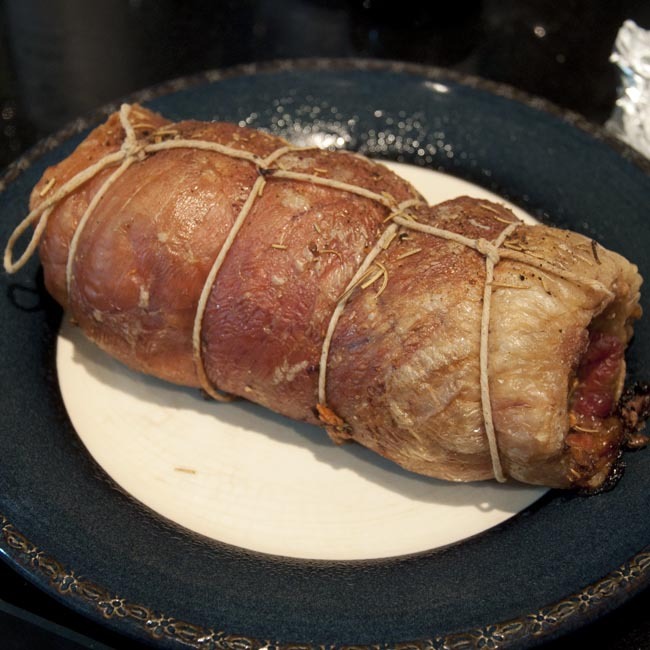 Put the rolled join in a roasting dish, drizzle with olive oil, sprinkle with pepper and dried rosemary, and put into a low oven (about 160C) for two and a half hours. Prepare whatever roast veggies you prefer (I did spuds and sweet potato) and start these at the appropriate time. You could even have yorkshire puddings (we did!). 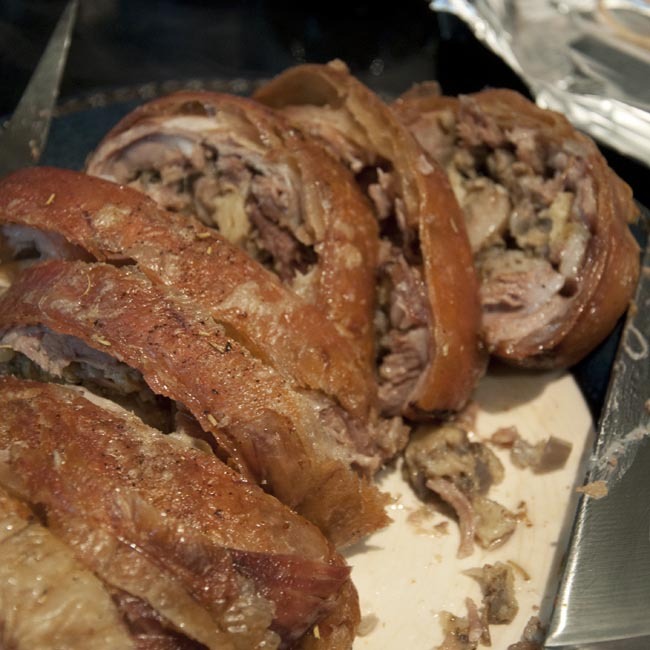 Then in due course get the joint out to rest, prepare your green veg and gravy, and dish up. 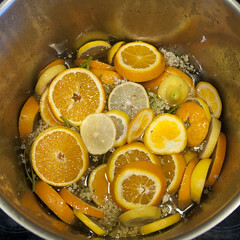 Add some nice fruit jelly, if you have some. Crab apple and chilli jelly was a perfect accompaniment. This is a fabulous roast dinner, and will serve three or four for nearly nothing – we’re greedy so it fed two hungry adults! Serve with a nice beer or a glass of red wine, and enjoy! 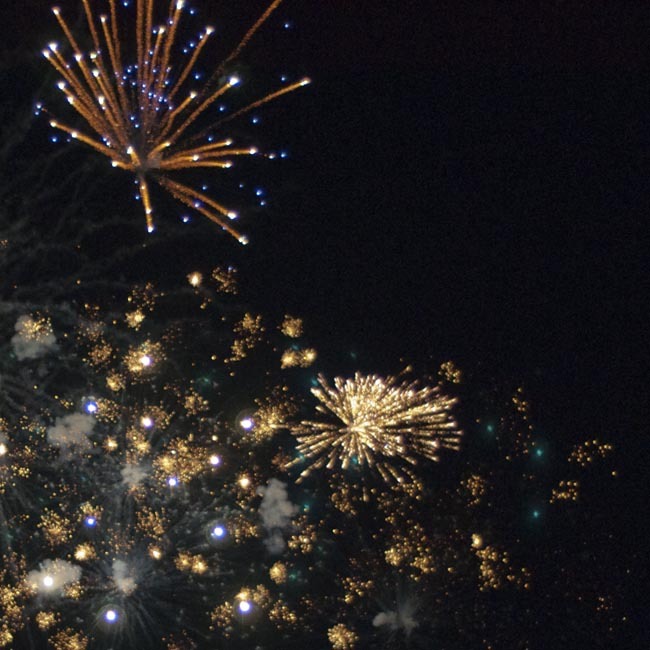 Here’s wishing all of you a very happy 2012, and hoping your new year’s celebrations went with a bang! I should have written this yesterday, of course, but timeliness has never been one of my more natural talents (as people still waiting on Christmas cards from me will attest)! I’m ambitious to do experiment with even more creative, country skills and crafts next year, and write about them too! 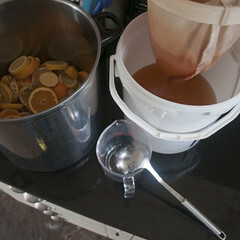 On my list is more brewing (cider, beer, and of course country wines), more curing and smoking, and experiments with sewing, crafting, recycling and thrift. More food and recipes, of course, as well as some fruit & veg growing as the season starts to get warmer. I also plan to write a little about my hens and poultry keeping, and to try some new crafts – at the moment I’m reading about candle and soap making, so watch this space. 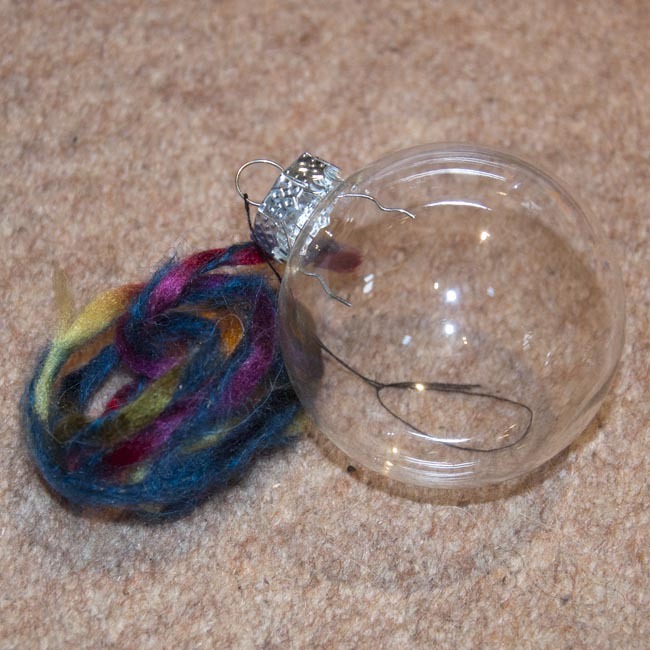 Perhaps this year my Advent candle might even be homemade! Thank you to all of you who have been reading the blog since it started back in October 2011 – both here on WordPress and in the syndicated feeds – your comments and feedback mean a lot to me and are very helpful, so please keep them coming! I’d love to hear of any suggestions you might have for things I should be looking into and trying, too! 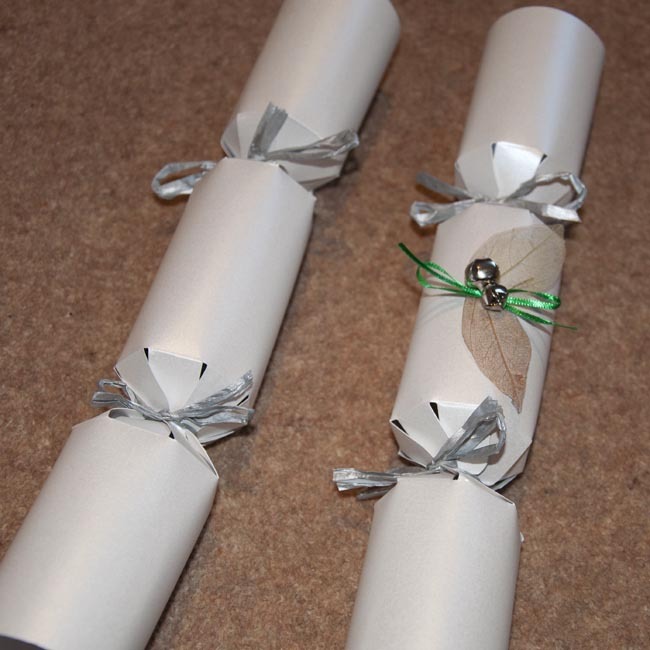 Handmade Christmas – cracking crackers! Christmas crackers are great, and an essential part of Christmas dinner in my house. I mean, what’s not to like about adults wearing silly paper hats after a lovely meal and plenty of wine? But the ones I’ve bought always seem to contain absolute rubbish which no one would ever want. How about making your own, with the traditional silly paper hat and motto, but with the added bonus of a small, thoughtful gift, an after dinner chocolate, or both? Well, it’s simple and fun, here’s how! Some cracker ‘blanks’, these are widely available from craft shops and on the internet in various sizes, colours and pack sizes. I chose plain silver ones. Cracker ‘snaps’, if these aren’t included with the blanks, one for each cracker you plan to make. Ribbon, wool, raffia or string, for tying the crackers up, as decorative as you like. Decorations for your crackers, if you want. I used metallic leaf skeletons, some ribbon and a couple of small jingle-bells, all glued in place, but be creative, anything from the card making section of the craft shop is a good place to start, or how about some decoupage with last year’s Christmas cards? Finally, cracker gifts! I found some quite cute keyring gadgets of various kinds and also added a nice after-dinner chocolate. If the gifts are for specific guests, put name-labels on the crackers. Scissors, sticky tape, and clear glue. Make hats and mottos yourself! 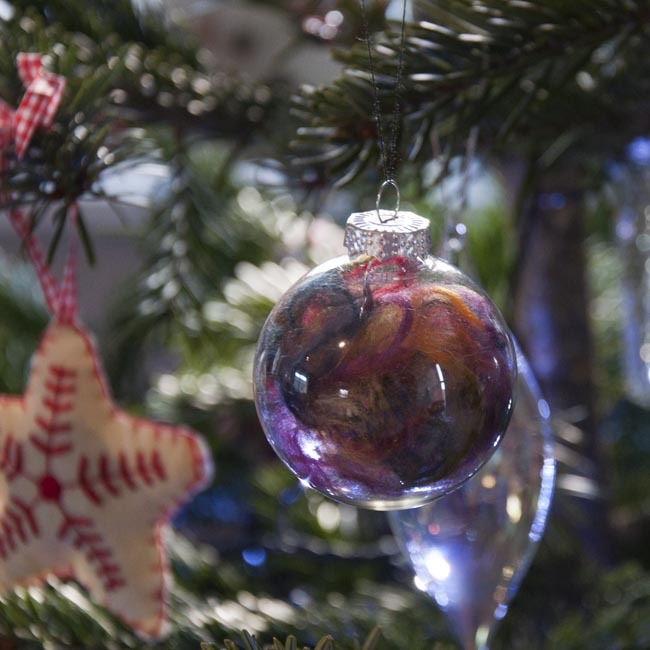 Making them couldn’t be easier and is a crafty relaxing way to spend a dark December evening. Start by sticking one end of the cracker snap onto the cracker blank with sticky tape. Then roll the cracker blank using the tabs (cracker blanks have slightly varying designs, so follow the instructions that come with yours!). Pinch, twist and tie up one end of the cracker with the string, ribbon, or other thread you’re using – I used silver paper raffia. Now fill your cracker with all the bits and pieces, and tie up the other end of the barrel in the same way. Once you’ve tied this up, stick the second end of the cracker snap into place. You can decorate the crackers now however you like! ‘But what about my hat and motto’, you may be thinking? I did see hat-and-motto sets for sale, but they’re awfully expensive considering what you get, a cheap tissue paper crown and a small slip of paper. Making the hats couldn’t be simpler. Get some Christmas wrapping paper, I used the end of a roll of white and silver metallic paper which I had knocking around. First, measure the circumference of your head (unless it’s unusually large or small, in which case perhaps find someone with a more ‘representative’ head to measure – then again, you’ve made them, so perhaps it’s only fair to claim the perk of a cracker hat which fits for once!). 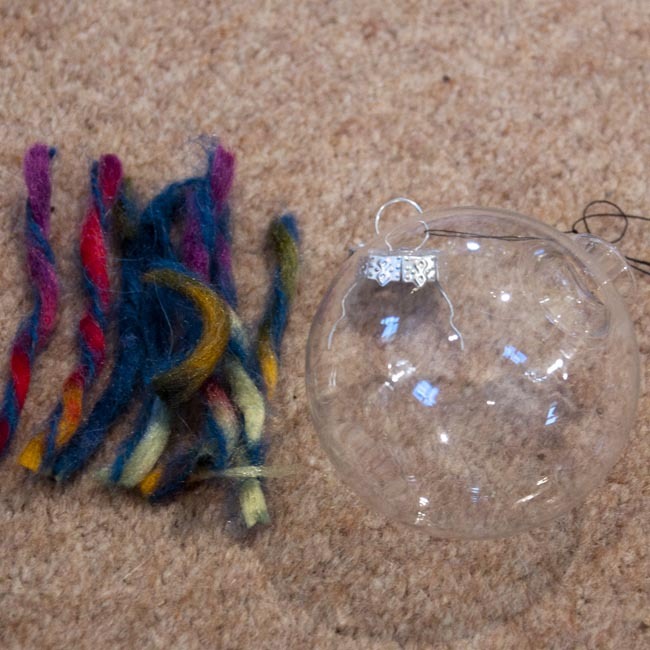 Now cut some pieces of wrapping paper twice as wide as the finished hat you want, and about 1cm longer than the circumference you’ve measured. Using clear sticky tape, stick the paper into a loop. Now fold the loop flat (image 1), then in half, then fold each of the halves into three, so that you’re now on the central panel of the film-strip above. 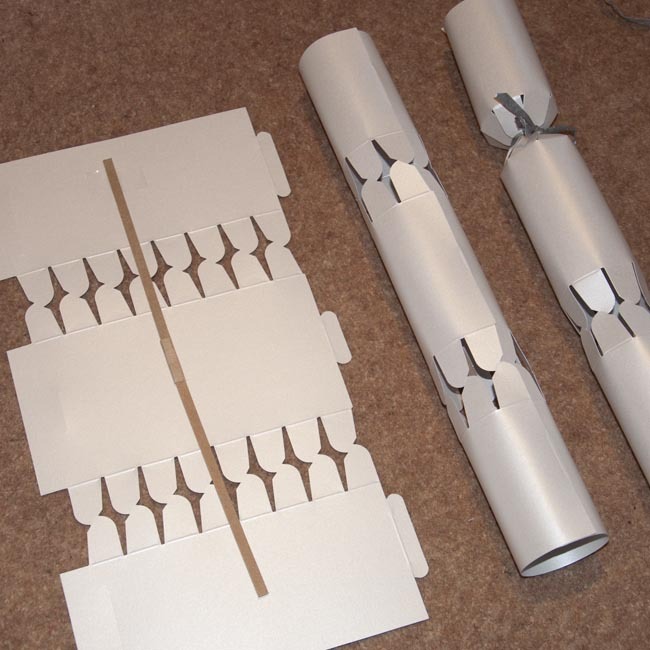 Now fold this in half one last time, then make a single diagonal cut half-way up the paper. Unfold your two zig-zag topped crowns. It’s like being back in primary school! And since they’re neatly folded, tie them that way with ribbon or a small elastic band. For the mottos, anything goes! Good (or bad!) jokes, limericks (or haikus? ), brain teasers, interesting facts, or even thoughts for the season or personal wishes for your family and friends’ year to come – make them pretty in a word processing package, print them out, cut into strips and fold them up with your paper hats. Crackers needn’t just be for Christmas – they’re a lovely creative way to package small, special gifts. An unusual way to wrap a special piece of jewellery, perhaps even a surprise ring? 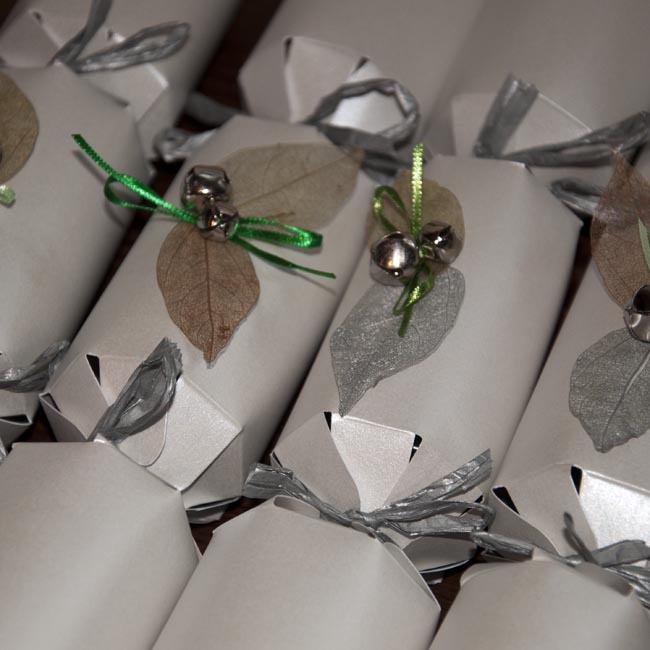 Or consider using crackers to package wedding favours?